Liberty Athletics understands your game day experience begins long before kickoff at Williams Stadium and we are here to make your entrance to campus as smooth as possible on Saturday. Free general parking is available in the LaHaye, Doc's, Evans, and Fincher Lots as well as in the Academic Commons Parking Garage. Lots closer to Williams Stadium are reserved for Flames Club members, with preferred parking privileges beginning at the Eagle Level ($120). 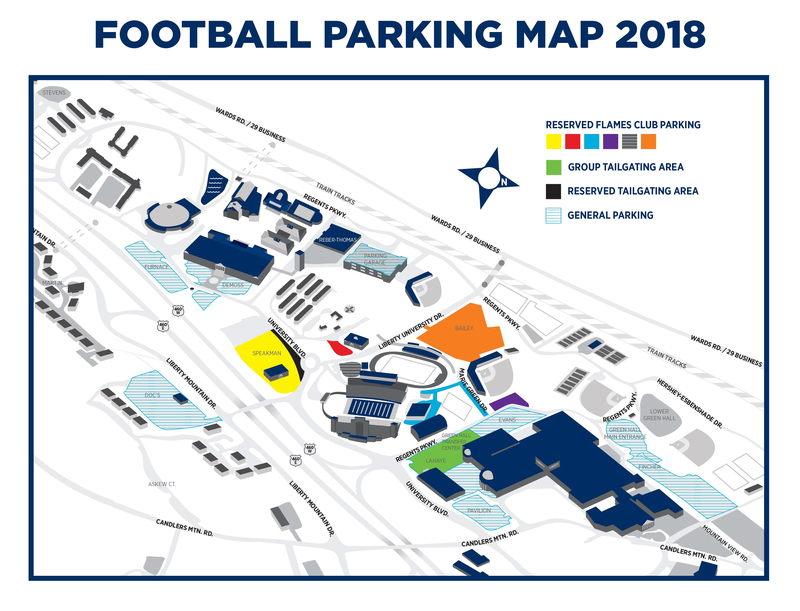 All Flames Club member who are Silver, Red, Yellow, and Orange Lot pass holders will need to enter campus via the Wards Road tunnel, with all but Yellow Lot pass holders then proceeding up Liberty University Drive. Yellow Lot Pass holders must turn right on Regents Parkway and travel around the residence halls on the circle and use the new road behind the LU Bookstore. Reserved parking lots are open as early as 9 a.m. on game day. Parking passes should be extended out the window in plain view when approaching all officers and attendants, and will be hole-punched upon entry to the respective lots. LUPD will direct all postgame traffic from all lots in a pattern designed to accelerate exit. Flames Nations fans please note that University Blvd. around Williams Stadium is closed three (3) hours prior to kickoff. The traffic stoppage begins at the stop light at Regents Parkway near the LaHaye Ice Center and extends to the bridge over the 460 Highway near the Doc's Diner parking lot. Only Silver, Red and Orange Lot pass holders will be allowed up Liberty University Drive from the Wards Road entrance of campus. 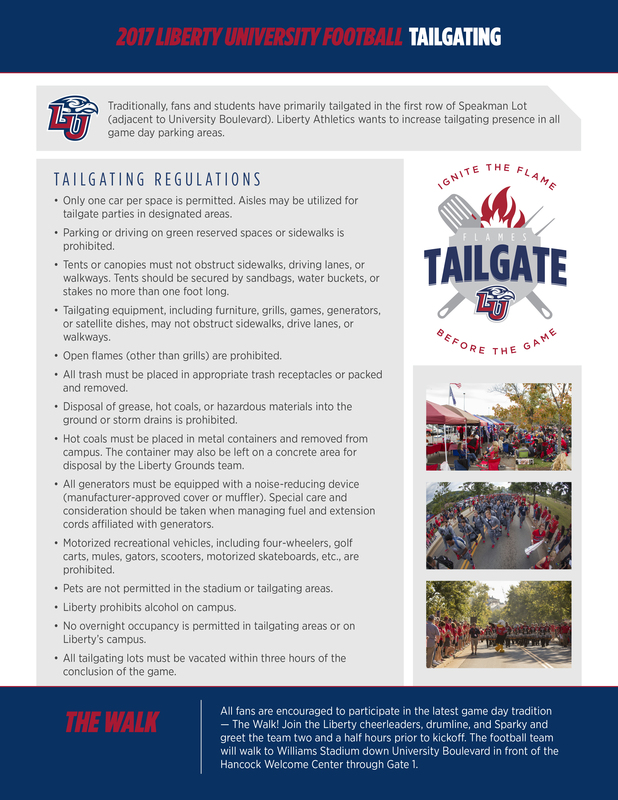 Game day tailgating is permitted and encouraged throughout the Liberty University campus on football game day. Flames Club members at the Coaches Level ($600) and higher are eligible to request special passes for reserved tailgating. Members at the Coaches Level and higher may request special Black Tailgate Passes on a game-by-game basis for the front row spaces of the Yellow Lot facing University Blvd. Email FlamesClub@liberty.edu for more information.